Keichousaurus are one of the types of dinosaurs, which belong to the Triassic era. These were known to have been lived around 215 million years ago. The term Keichousaurus was derived from the Greek word “Kweichow lizard” and it is pronounced as Kay-choo-sore-us. From the fossils of Keichousaurus, it has been found that it would have been six to twelve inches (i.e.) about 15-30cms long. But, researchers were not able to judge the weight of this dinosaur. The diet of these dinosaurs was fish. These Keichousaurus would have got five toed feet and it would also have got long tail and neck. It has also got sharp teeth with pointed head. Keichousaurus was known to be one of the well-known examples of the obscure reptile order called pachypleurosauria. The pachypleurosaur and the Keichousaurus are sometimes called within nothosauroidea and are listed separately as well. It was among the seniors of all aquatic reptiles and it might have been ancestor of the big pilosaurs and plesiosaurs of the cretaceous and Jurassic period. 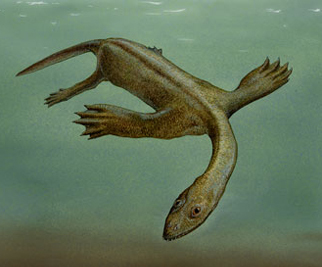 From the fossils of Keichousaurus, it has been found that it would have spent most of the time in water, but would have crawled onto the land with the help of its strong front legs. The fossils of Keichousaurus were found in the country of China in the Guizhou Province in the year 1957. These fossils were among the general sauropterygian fossils recovered often found as articulated bones, nearly completed. This is the main reason of the popularity of the skeleton of Keichousaurus among fossil collectors. As said earlier Keichousaurus are known to have been lived in water and their flattened limbs would have acted as hydrofoils. On the other hand, the hind limbs of these dinosaurs would have got less specialization and these limbs would have acted as control surfaces and as stabilizers as seen in sea turtles. It has also been found from the bones of the limbs that these dinosaurs would have crawled through the water as done by small freshwater turtles. The pactoral gridle of these dinosaurs were powerfully built and these would have enabled the attachment of strong muscles and it has been found that these pactoral gridle might have been located under the shoulder, which would have been used by Keichousaurus for swimming. In addition to the limbs of Keichousaurus, the tail also resembles aquatic reptiles. It has been found that the powerful muscles of the tail would have enabled it to undulate from side to side and to beat as well. Keichousaurus are regarded as ovoviviparous (i.e.) reproducing by eggs developed inside the body, but this was not proved. The fossils of Keichousaurus display a lack of ossification and a simplified elbow joint in the process of olecranon of the ulna. This would have been enabled these dinosaurs to crawl up the beach for laying eggs. The specimen found in same type of sediment and at different developmental stages at the same locality is known to support an ovoviviparous model. However, from the fossils of the female Keichousaurus it has been found that it had fetuses within the lower portion of the thoracic cavity.